With the upcoming holidays and the New Year approaching, we all have the urge to work out more. Whether it’s to shed the extra pounds we put on at Thanksgiving or we are making another New Year’s Resolution to work out more, we all need to be physically active to be healthy. Although we no longer have to worry about "sweating out our perm", us natural ladies have other issues we must address when working out. This is a big issue for us as some styles take hours to complete and we don't want that to be ruined after one trip to the gym. So, my tip is to either wear wash-n-gos that can be easily redone or protective styles. My hair is not wash-n-go friendly, so I tend to wear lots of individual twists or flat twist/braided updos that will last a few days. This helps to keep my hair moisturized and also saves time so I don't have to redo my hair every day. The first and easiest measure you can take is to wear a sweat band or scarf, however we all know that it's hard to contain all of that FROtastic hair. And not to meantion, the more you sweat, the BIGGER and more out of control it gets. The two tips I have for you are to A.) seal in your moisture before your workout and as soon as you can after or B.) 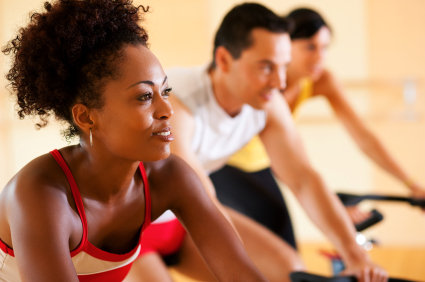 rinse or cowash your hair after your workout to start with fresh, clean hair the next day. As I said above, I wearing mostly protective styles, but I also do a mid week cowash to help cleanse my scalp. Some other naturals also find that just doing a quick rinse with water helps after a workout as well. Our lives are busy enough without adding a workout routine into the mix, so making a schedule for our hair is very important. If you know you are going to work out on Monday, Tuesday, Thursday and Friday, then you can make Sunday and/or Wednesday your hair spa day. When your "hair appointment" is scheduled with yourself you don't feel rushed and you are able to give your hair the TLC it needs. Whatever you decide, make a routine and stick to it. Keeping a good routine holds you accountable and makes it easier to juggle every thing going on in your life. We work hard for our healthy hair and our healthy body so take some time to keep it that way.